Awhile back I ordered a bunch of these metal label holders, not really with a project in mind I just liked them. Well, they have been sitting in a drawer for over a year now and last night on a cleaning/organizing/crafting kick I got them out and put two of them on this little white drawer thing I have in the kitchen. Can you see all those little labels on the edges of the shelves? I just LOVE how this closet is so neat and clean...makes me giddy. Nope. You're not alone. If you're nuts about labels and organizing, then I'm in the cuckoo's nest with you! P.S. 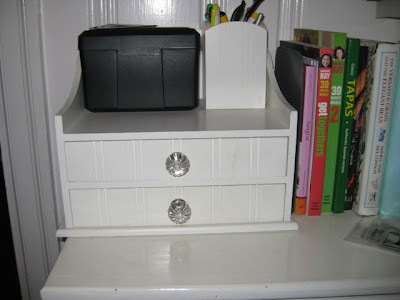 - I did a very similar thing to one of those organizer drawers. Hopefully you'll be more successful at corraling your man than I was! Ooh, I love those! I could use them in the closet in the nursery... it would make it easy to change the labels since my daughter grows out of her baby clothes and I'm always reorganizing the drawers. You're definitely not alone! 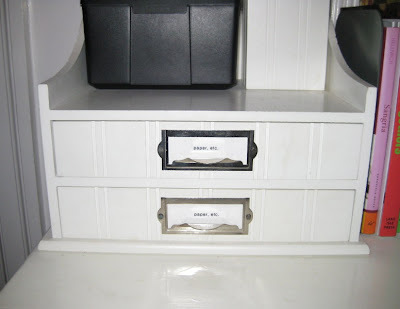 There's something about a label maker that just makes the things being organized look so much more important. Maybe that's because my handwriting is terrible! oh my, I am an organizing junkie almost to a fault. love the label holders. hope you have a wonderful weekend. I love organizing! The label holders look amazing-what a simple, yet huge transformation. Oh my gosh no. I got a label maker for Christmas and I labeled my entire pantry. It was awesome. If you are nuts, then so am I. 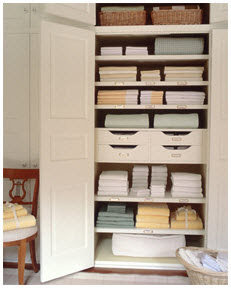 Because that Martha Stewart linen closet photo is in my inspiration book of all-time great organizational photos. NO!!! I am the EXACT same way..I moved in to my bf's house 5 months ago and the FIRST thing I did was organize "our" closet, which was previously his. And now we constantly get compliments on how organized it is. hah. I'm obsessed with labeling and having things match...I only use white hangers for example, and they all have to hang the same way. I feel ya girl! That closet is my dream...love the labels, need to get me some of those! thx. You are definitely not alone! Speaking or organization, I am also a fanatic about color coordinated hanging files and file folders in my office - currently using pink hanging files with gray folders that I ordered from Office Max (tons of colors on-line). Have you ever looked at seejanework.com - I think you'd love it! I love organizing! Labels make me giddy too! Oh no, you're not alone! One of my favorite things is a well organized closet. It makes me incredibly happy. I'd love to have labels like that for my linen closet but since it's a rental I'm holding off. oh, i love this. i need this. i also have another ? : is there any way you coul email me step by step how u re did your fab chair..im trying not to wing it, and you totally inspired me!